We need more animations of the Hitchhiker's Guide to the Galaxy! There's plenty of attempts at providing fan animations for Hitchhiker's Guide to the Galaxy's more famous scenes, but Holy Zarquon's Singing Fish, there aren't enough scenes from later episodes! 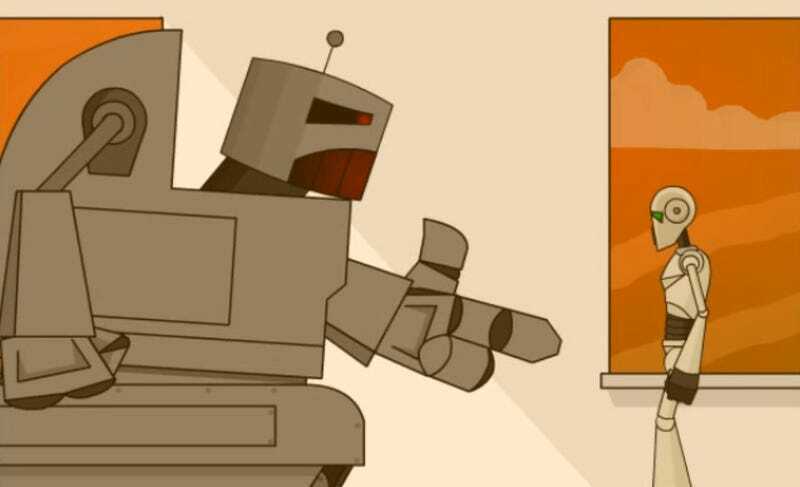 I was digging around the internet for scenes of Marvin's death, even his sorta death in the poorly-executed movie, for the post about robot deaths, when I ran across some animations by Nick Page. Some are not fully polished yet, but the heart's there, and the original designs seem spot-on. And heck, any chance to see Lintila in action is worth it for me! And, of course, the Whale. Not bad attempts really. Makes me wish BBC would put out some official animations. As much as I love the radio series, it's hard for me to share them with people unaccustomed to audio drama. More importantly, I think some of the more obscure bits in the Secondary Series deserve more attention. I'm still convinced the Bet She'an short film was inspired in some way by the origins of Brontitall.